Melchizedek, sometimes written Malchizedek, Melchisedec, etc., is a figure mentioned in the Book of Genesis who shared a sacramental meal with Abraham after the patriarch's military victory over a coalition of kings who had taken Abraham's nephew Lot prisoner. Called a priest of "God Most High," Melchizedek was the king of Salem, later called Jerusalem. He blessed Abraham and received a tenth of his battle spoils. 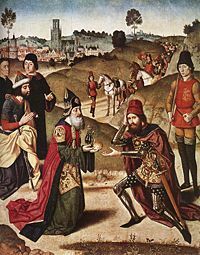 Various legends grew up around the mysterious figure of Melchizedek in both Christian and Judaic traditions. In rabbinical tradition he is a holy man whose blessing resulted in great fortune for Abraham, while in Christianity his priesthood is seen as the forerunner of the Christian "new covenant," superseding that of the Levite priesthood. He is commemorated in the Calendar of Saints of the Armenian Apostolic Church on July 30. Melchizedek's name can be translated (from Hebrew) either as "Zedek is my king" or as "My king is righteous." The former, which treats Zedek as a proper noun, refers to a Canaanite or other semitic deity with that name. The term appears again in the Hebrew Bible in the name of the Jebusite king Adonizedek ("My Lord is Zedek") who led a coalition of five of the neighboring Amorite rulers to resist the invasion of Joshua, but was defeated at Gibeon. The planet Jupiter is called Zedek in Hebrew astronomy. Zedek, as worshiped by the Jebusites, may have been identical with El (אל), who was also Abraham's God, identified with Yahweh. In this case, Zedek ("The Righteous") would simply be a prominent epithet, just as "The Almighty," "Most High," or "The Holy One" might be. The name of Zadok, the Israelite priest, is related to the same root semitic word as Zedek. In Genesis 14, Melchizedek is also referred to as King of Salem, generally believed to be ancient Jerusalem) the fortress city of the Jebusites. He is also identified as the priest of El Elyon. Though traditionally El-Elyon is translated as most high God, and is usually interpreted as a reference to Yahweh/El, some scholars believe that it refers to Zedek as a distinct deity from El. Rabbinical tradition concerning Melchizek is a rich one. Some ancient rabbis identify Melchizedek with Shem son of Noah, for if the biblical chronology is taken literally, Noah was still living in Abraham's day (e.g., Babylonian Talmud Nedarim 32b; Genesis Rabbah 46:7; Genesis Rabbah 56:10; Leviticus Rabbah 25:6; Numbers Rabbah 4:8). Rabbi Isaac the Babylonian said that Melchizedek was born circumcised (Genesis Rabbah 43:6) Melchizedek instructed Abraham in the Torah (ibid). Rabbi Eleazar said that Melchizedek’s school was one of three places where the Holy Spirit manifested itself (Makkot 23b). 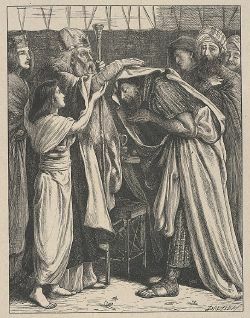 Melchizedek acted as a priest and handed down Adam’s robes to Abraham (Numbers Rabbah 4:8). Rabbi Zechariah said, on Rabbi Ishmael’s authority, held that God intended to bring forth the priesthood through Melchizedek’s descendants, but because Melchizedek blessed Abraham before he blessed God, God brought the priesthood forth from Abraham’s descendants (Nedarim 32b; see also Leviticus Rabbah 25:6). Rabbi Judah said that Melchizedek’s blessing yielded prosperity for Abraham, Isaac, and Jacob (Genesis Rabbah 43:8). Ephraim Miksha'ah, the disciple of Rabbi Meir, opined that Tamar descended from Melchizedek (Genesis Rabbah 85:10). Rabbi Hana bar Bizna identified Melchizedek as one of the four craftsmen of whom the prophet Zechariah wrote in Zechariah 2:3 (Sukkah 52b). Moreover, when David wrote the Book of Psalms, he included in the work of Melchizedek in Psalm 110 (Baba Batra 14b-15a). The the later kabbalistic text, the Zohar, finds in “Melchizedek king of Salem” a mystical reference to “the King Who rules with complete sovereignty,” or according to another explanation, that “Melchizedek” alludes to the lower world and “king of Salem” to the upper world (Zohar 1:86b-87a). 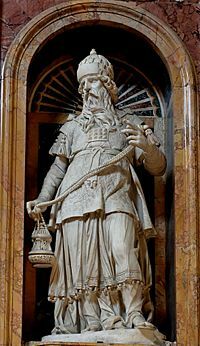 Statue of Melchizedek. Santa Maria Maggiore, Rome. The author of the Epistle to the Hebrews characterized Christ as "a priest after the order of Melchizedek," who brought to a close the era of the Levite priesthood and offered himself as a sacrifice "once and for all." Consequently, Christians often believe that Jesus plays the role of High Priest in the "new covenant," which supersedes and may even replace the "old covenant" centered on Abraham and Moses. 1. Abraham paid tithes to Melchizedek; later, the Levites would receive tithes from their countrymen. Since Aaron was in Abraham's loins then, it was as if the Aaronic priesthood were paying tithes to Melchizedek (Heb. 7:4-10). 2. The one who blesses is greater than the one being blessed. Thus, Melchizedek was greater than Abraham. It follows that Melchizedek is also greater than Levi (Heb. 7:7-10). 4. The basis of the Aaronic priesthood was ancestry; the basis of the priesthood of Melchizedek is everlasting life; it does not end due to a priest's death (Heb. 7:8,15-16,23-25). 5. Christ, being sinless, does not need a sacrifice for his own sins, as do the Levite priests (Heb. 7:26-27). 6. The priesthood of Jesus/Melchizedek is more effective because it requires a single sacrifice once and for all, while the Levitical priesthood made endless sacrifices (Heb. 7:27). 7. The Aaronic priests serve in an earthly copy and shadow of the heavenly Temple, in which Jesus serves (Heb. 8:5). The epistle emphasizes that the covenant of Jesus is superior to the "old covenant" in which the Levitical priesthood served. Some Christians hold that Melchizedek was a type of Christ, and some even believe that Melchizedek indeed was Christ, since Jesus pre-existed his birth. Reasons provided include that Melchizedek's name means "king of righteousness" according to the author of Hebrews, and that being king of Salem makes Melchizedek the "king of peace." Hebrews 7:3 states, "Without father or mother, without genealogy, without beginning of days or end of life, like the Son of God he (Melchizedek) remains a priest forever." Melchizedek gave Abraham bread and wine, which Christians consider symbols of the body and blood of Jesus Christ, the sacrifice to confirm a covenant. The Book of Mormon of The Church of Jesus Christ of Latter-day Saints describes the work of Melchizedek in Alma 13:17-18. According to this tradition, Melchizedek was king over the wicked people of Salem, but because of his righteousness, his people repented of their wickedness and became a peaceful city. Also, in Joseph Smith's translation of the Bible, Melchizedek is described as "a man of faith, who wrought righteousness; and when a child he feared God, and stopped the mouths of lions." Because of his fear of God, Melchizedek was "ordained a high priest." This translation also describes Melchizedek as establishing peace in his city and being called "the king of heaven" and "the King of peace" (JST Bible Gen 14:25-40). Apostles direct the calling of Patriarchs and may ordain persons to all other offices and callings in the church. The president of the Church must be an Apostle. The Seventy are "Especial witnesses" of Jesus Christ; called to preach the gospel to the world. The may serve as general directors or regional authorities. Patriarchs are married holders of the Melchizedek priesthood, normally at least 55 years old, authorized to give patriarchal blessings to Latter-day Saints. High Priests are responsible for the spiritual welfare of the Saints. These are the local leaders and may serve in a bishopric, stake presidency, high council, or temple presidency etc. They may ordain other High Priests and Elders. Elders are the lowest rank. They must be at least 18–years–old. They confer the gift of the Holy Ghost, give blessings by the laying on of hands, ordain other elders, and have all the rights of the Aaronic priesthood. According to Genesis, Shem lived the age of 600 years (Gen. 11:10, 11). Therefore, his death took place 13 years after the death of Sarah and ten years after Rebecca and Isaac married. This literal interpretation of the biblical chronology leads some Christians, as well as several ancient rabbis, to believe that Shem might have been Melchizedek. The Jewish philosopher Philo of Alexandria (first century B.C.E.) treated Melchizedek as an allegorical figure representing Reason (Greek: Logos), a "righteous king" over the human being. His nemesis is Mind (Greek: Nous), which leads human into evil and unbridled passion. The collection of early Gnostic scripts found in 1945, known as the Nag Hammadi Library, contains a a document pertaining specifically to Melchizedek, and which has been assigned Melchizedek as its title. Here it is revealed that Melchizedek is indeed identical with Jesus Christ.. Although the text has deteriorated and is unclear in many parts, it appears to indicate that Melchizedek pre-existed as divine being, who, manifested on earth as Jesus Christ. Mechizedek also appears in several other Gnostic texts at Nag Hammadi, including the Pistis Sophia, and the Second Book of Jeu. ↑ Proponents of the Documentary hypothesis view the Melchizedek narrative (Genesis 14:18-20) as a fragment from a once independent tradition concerning Jerusalem, inserted into the surrounding narrative concerning the battle. ↑ Mechon Mamre, mechon-mamre.com, 2008. Retrieved February 18, 2008. ↑ "The Nag Hammadi Library" gnosis.org. Retrieved November 14, 2007. This page was last modified on 23 March 2018, at 15:16.